Let me see if I can get tonight’s game straight. I should be in bed. But I gotta get this down before I forget. Angelina and I were to meet JoAnna at the game tonight because she had the tickets. Since we got there early, we went to check out the “Centerfield Experience“. I usually don’t go there because I usually have to get into the field level by a certain time because I usually don’t have a field level ticket. Since I didn’t have a ticket at all, we took our time. On our way there, we ran into Cat, who joined us. 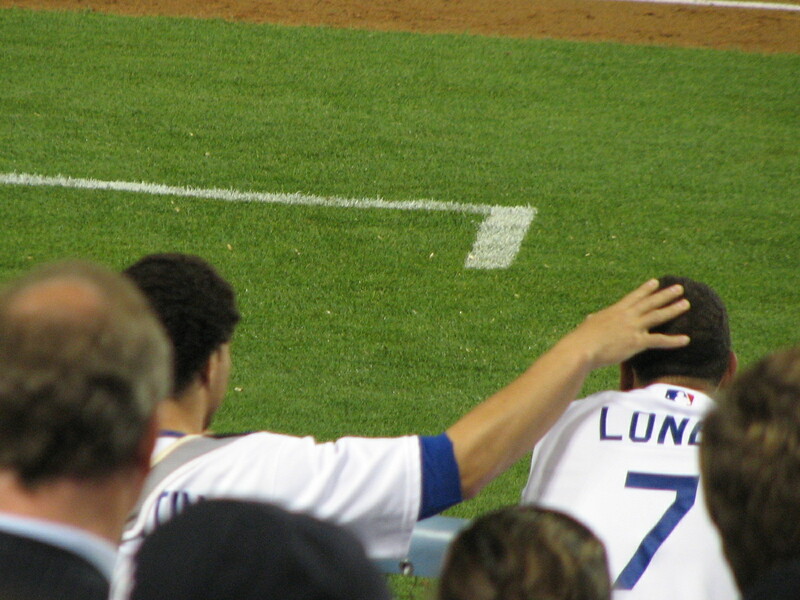 We were hanging close to the Left Field Pavilion so we wouldn’t get hit by any stray balls. While we were hanging out, this guy sees me and goes, “Gatewood, right? Remember me?” I was supposed to explain to Cat later who he was. 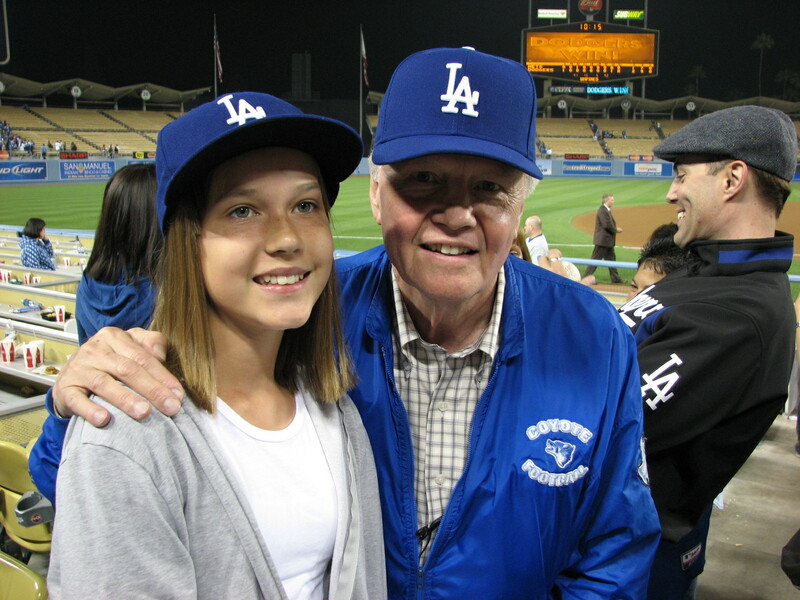 He lives in my neighborhood and we met about two years ago, after the Dodgers had a long extra-inning game against the Padres. 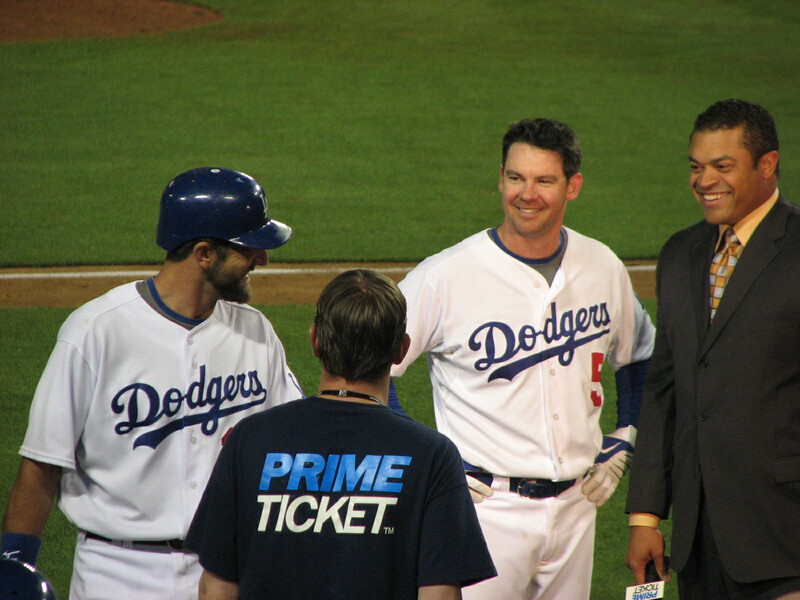 He saw my car and went on about what a great player Russell is (he was talking to the mail-man). I came out to get my mail and he asked me if that was my car. 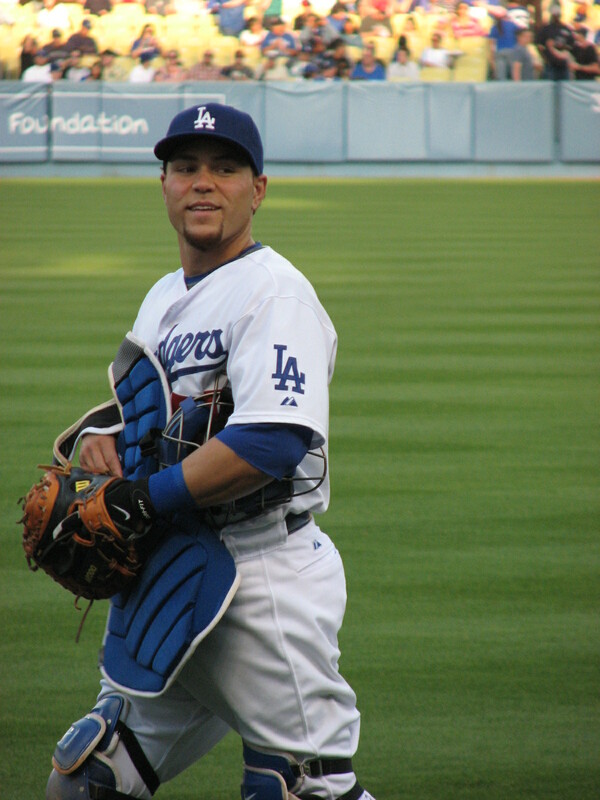 Since then, he’s see me and yell out “hey Russell Martin girl”. JoAnna and her daugther Hannah showed up, and we all went in. Cat had just gone in ahead of us. 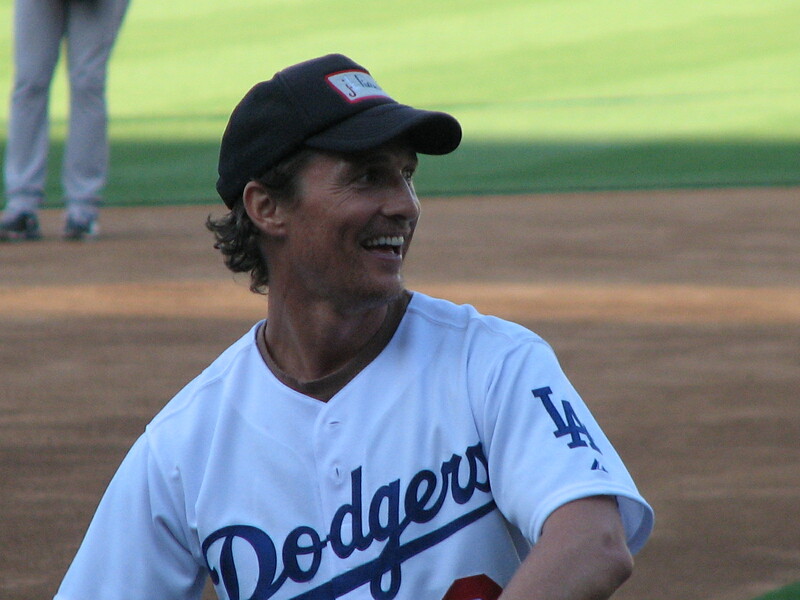 We separated for a little bit and then reconvened behind the dug out where Matthew McConaughey was warming up. 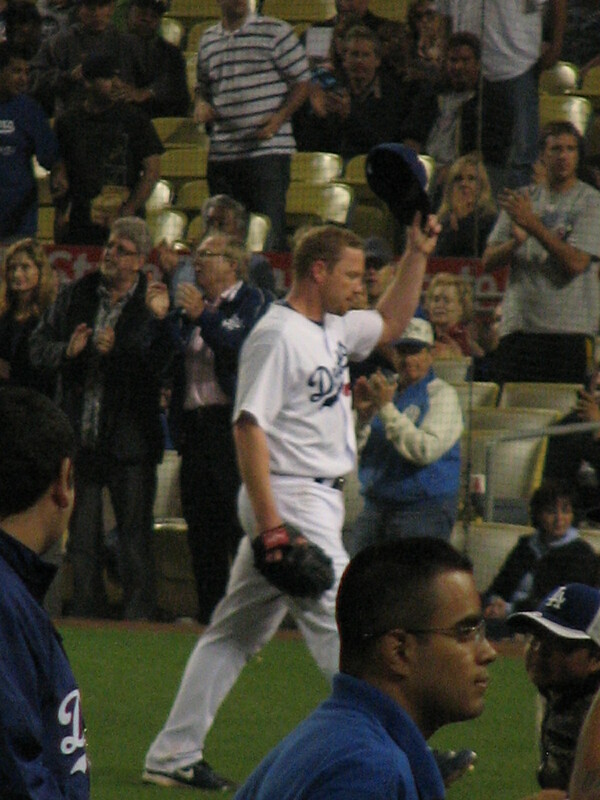 He was throwing the first pitch. And yes, I did have to google his name real quick to get the right spelling for it. This is where things get a little blurry. It was hard to keep track, especially since I didn’t take a photo of every player who waved to us (with a lot of yelling from Hannah, but we helped). I think Brent Leach waved to us first. LOL I can’t remember who waved to us in what order! 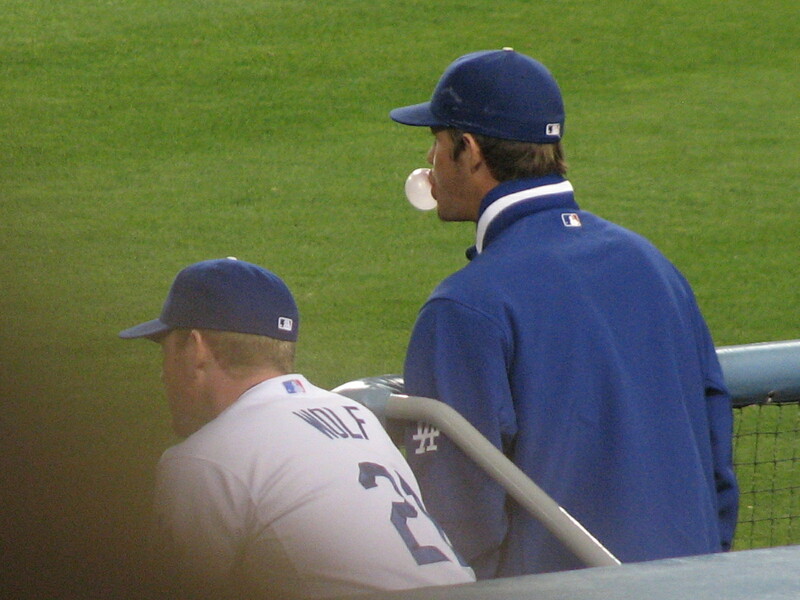 I know Randy Wolf, Clayton Kershaw, Brad Ausmus, Mark Loretta, Andre Ethier, and Mark Sweeney. I think I may be missing a player or two. 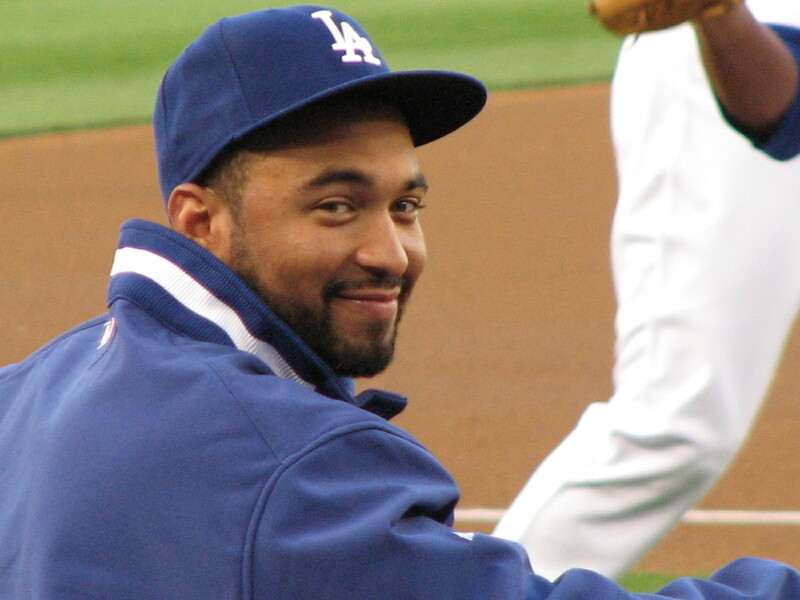 Matt Kemp probably did, too. Andre’s was hilarious. 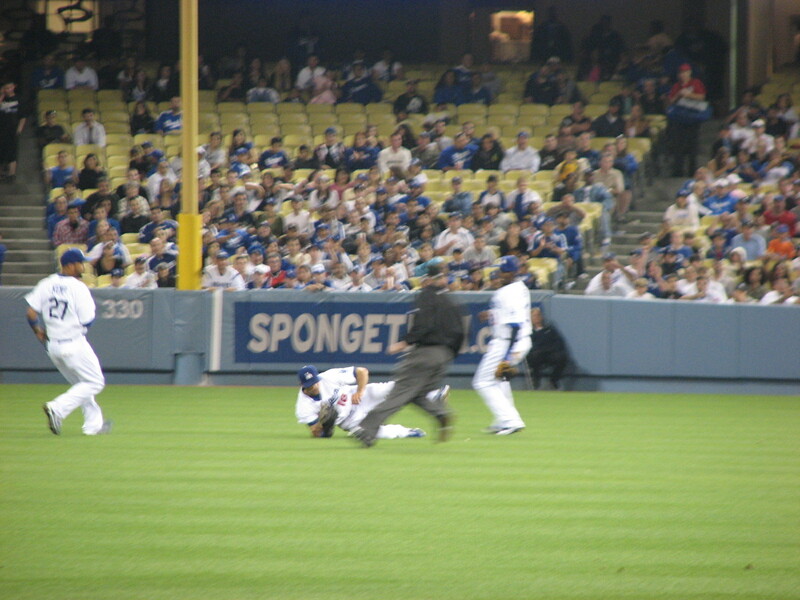 He was going down the dugout steps when we called his name. 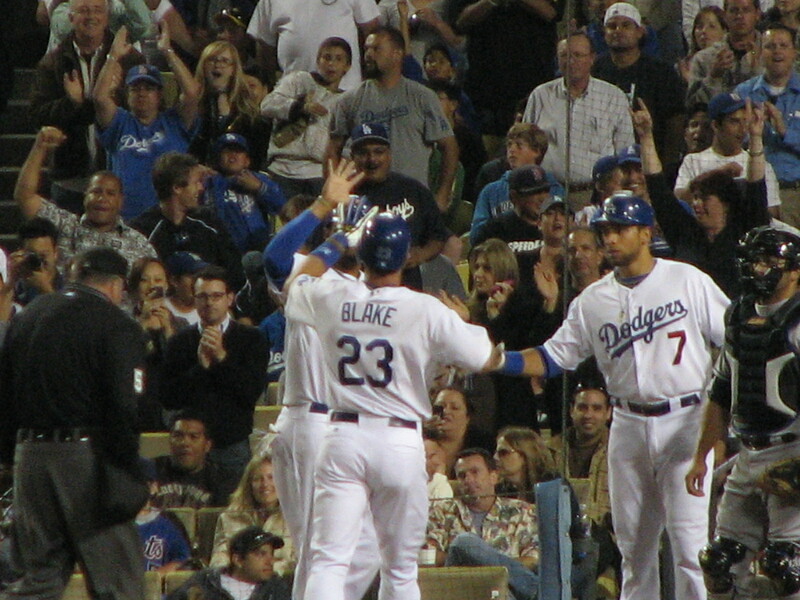 By the time he waved to us, all we saw was his hand sticking out over the dugout ceiling! Mark Sweeney took awhile because we were in the field level and he was up in the press box. He looked up a few times, like he heard his name. He finally saw us and waved down to us. 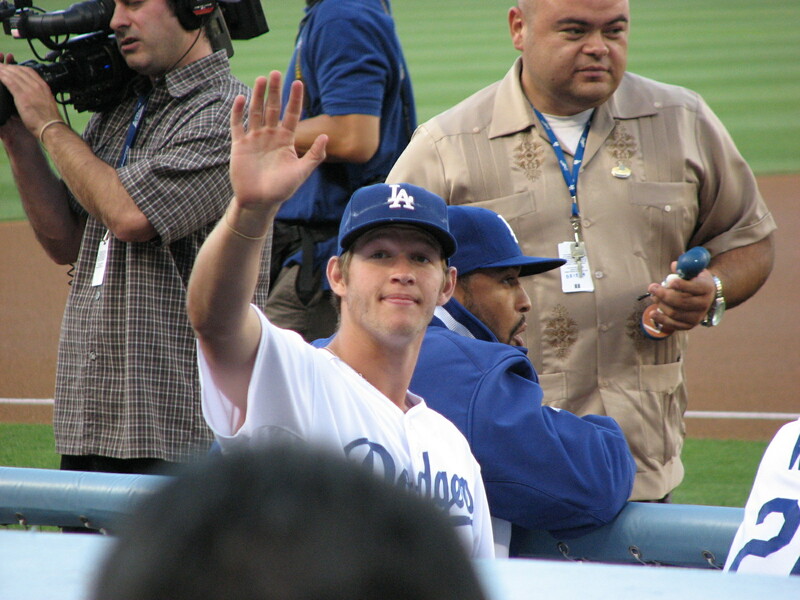 Clayton Kershaw waving to us. Angelina made a comment about how cute he was. She asked me how old he was. I told her he’s 21. She said, she could totally date him (she’s his age btw), to which I told her he had a girlfriend already. Then she said, because he hasn’t met me yet! 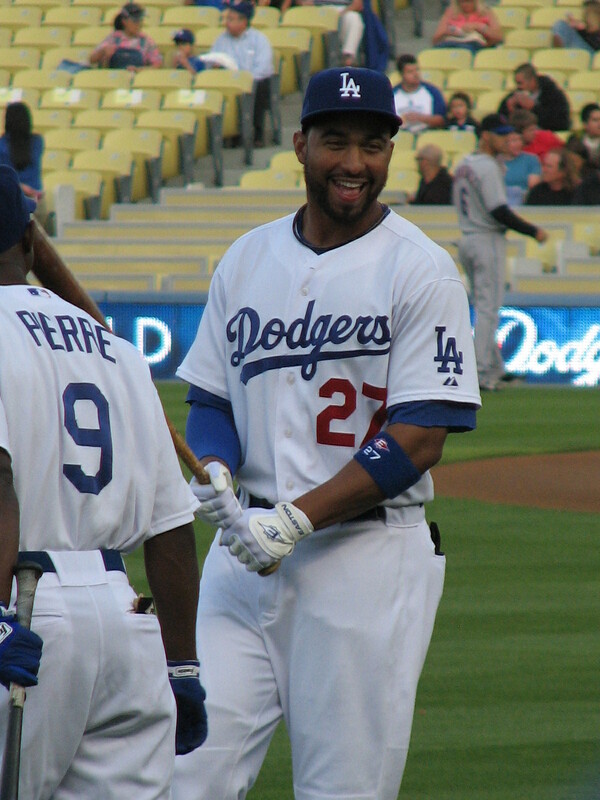 Matt Kemp had the night off. Well, the first couple of innings off. Xavier Paul started in his place. Alyssa Milano showed up. I didn’t even notice her till JoAnna pointed her out to me. 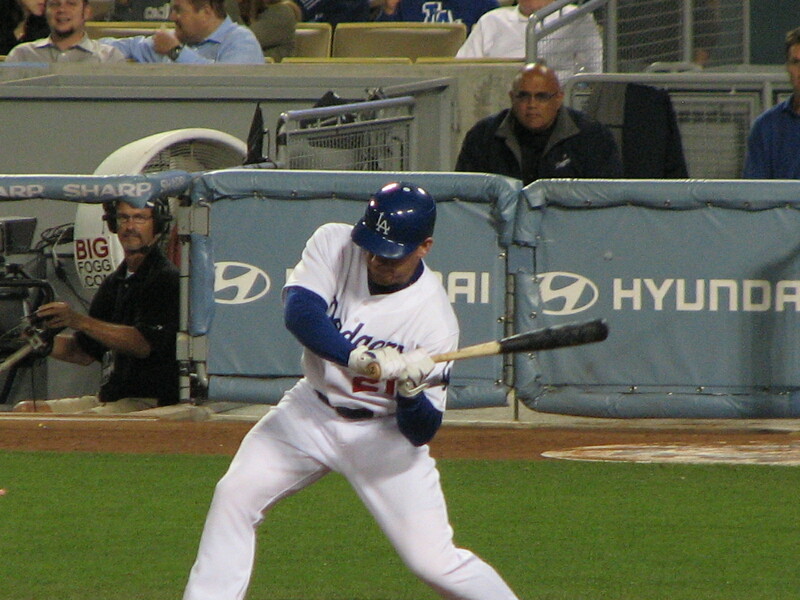 In the bottom of the 5th, I saw Randy in the on-deck circle. Eric Smith, who makes less errors in a year than the Mets do in a game, announced that Matt Kemp was pinch-hitting for Jeff Weaver. 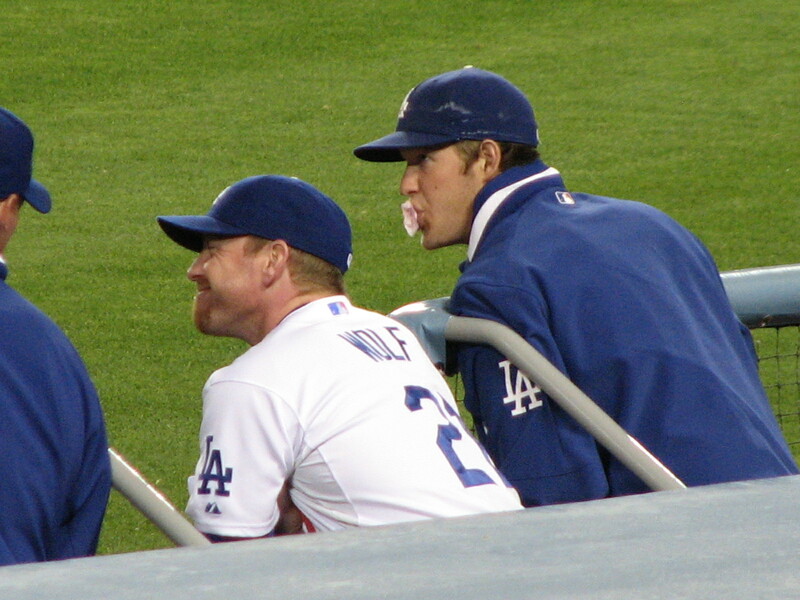 I was like … no that’s Randy. A little bit later, he goes, “Correction…” That’s only the second time I’ve heard him make a mistake. So we’ll cut him a little slack. 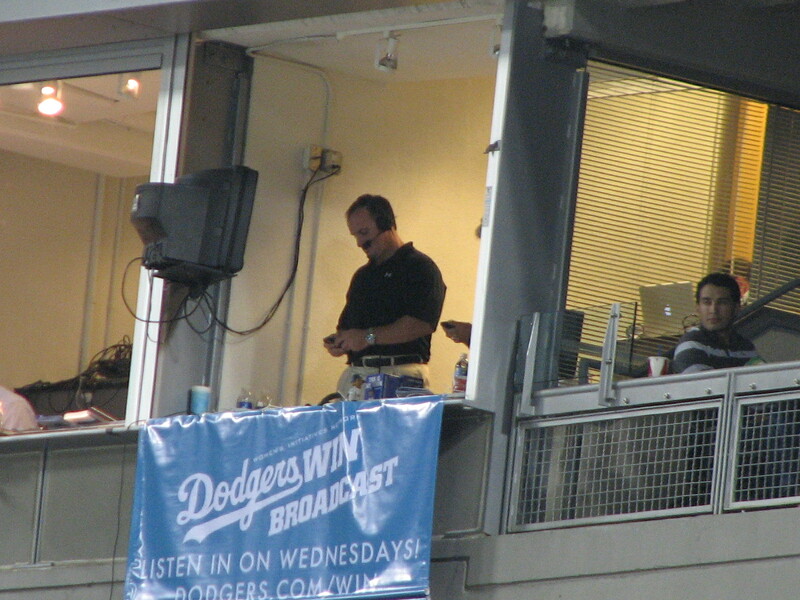 Mark Sweeney during the seventh inning stretch. Okay, so I did get one. But the person in front of me got in the frame too. 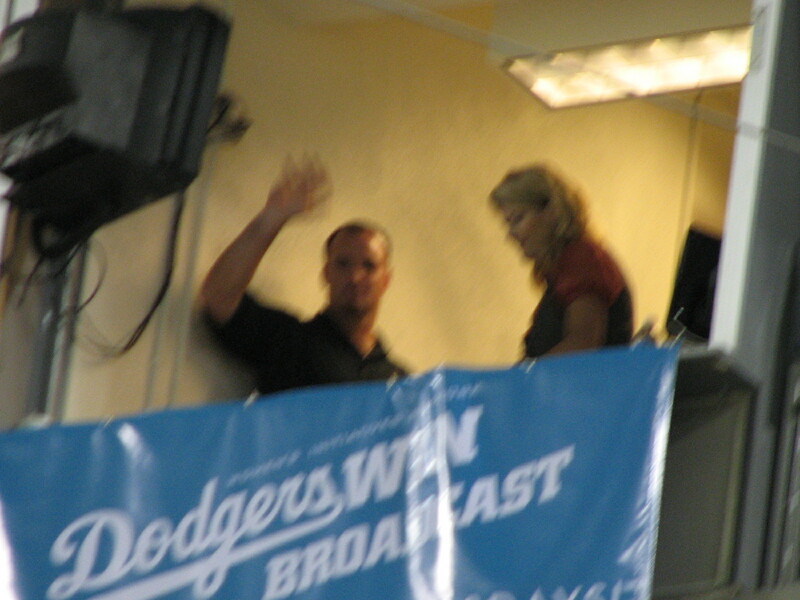 A little blurry, but here’s Mark waving to us from the booth. l for everyone, but I know members of the Mets and the Diamondbacks and anyone else who played alongside Scott must be in shock over this. want to know what’s in store for tomorrow. 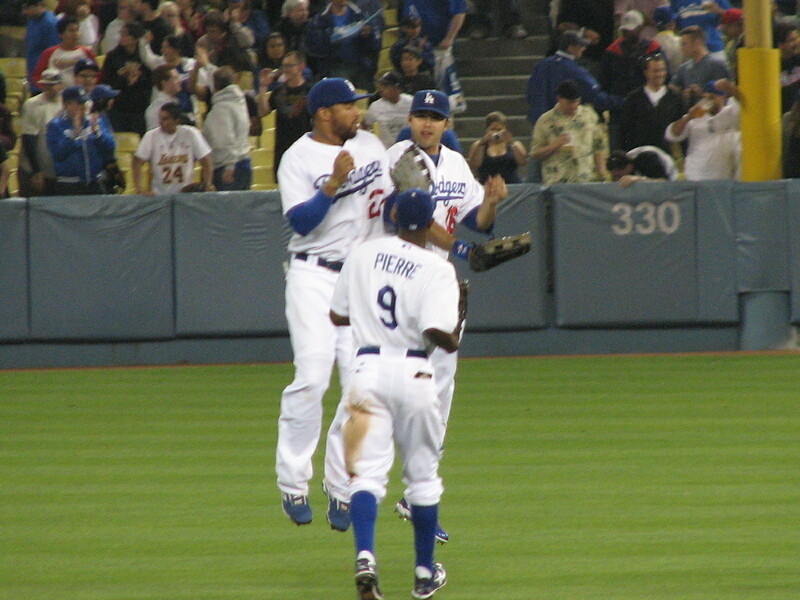 Hopefully a Dodger’s win. ago). Let’s pray nothing goes wrong there! get extra batteries, cash, and see if the Newstand there had copies. with a bunch of guys. 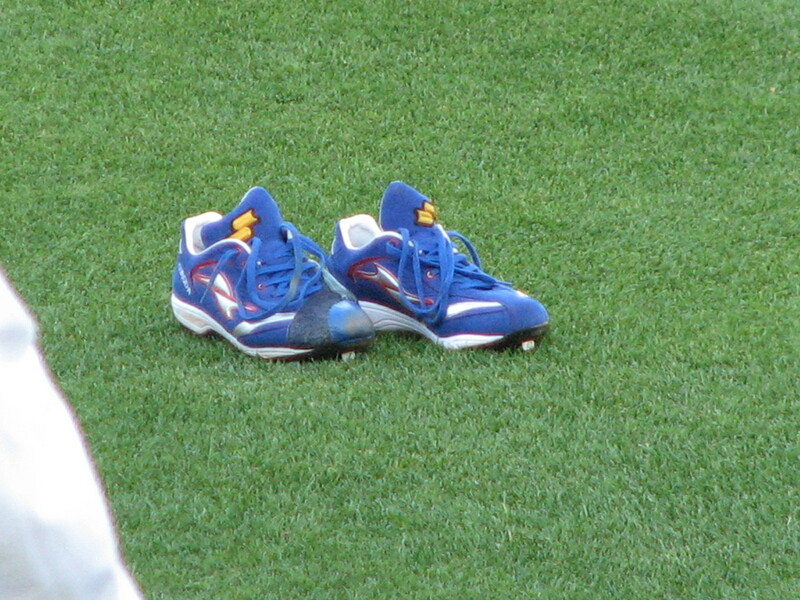 Those shoes were on the field during batting practice. Turns out, they are Kuroda’s. 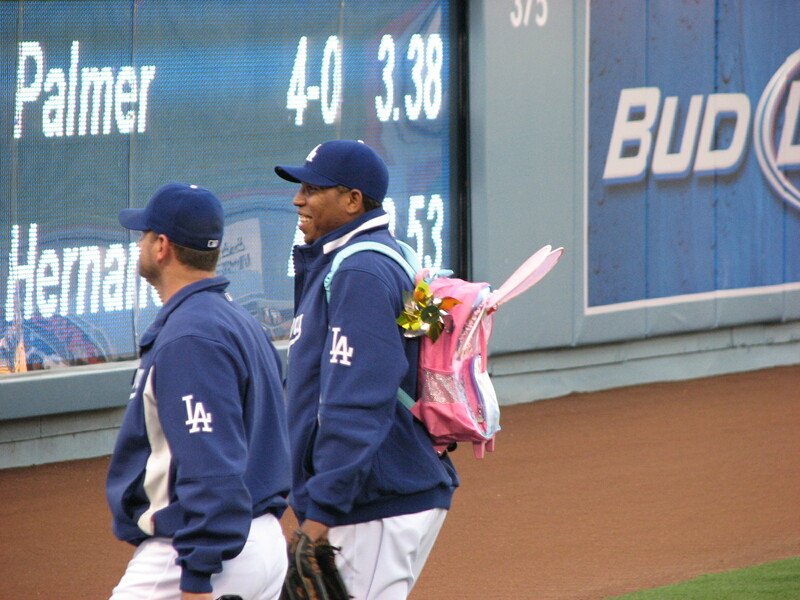 Russell heading to the bullpen. He did stop to sign a few autographs though. Poor Ronnie. Guess they’re getting started early this year. Wonder what the rookie hazing in September will look like! 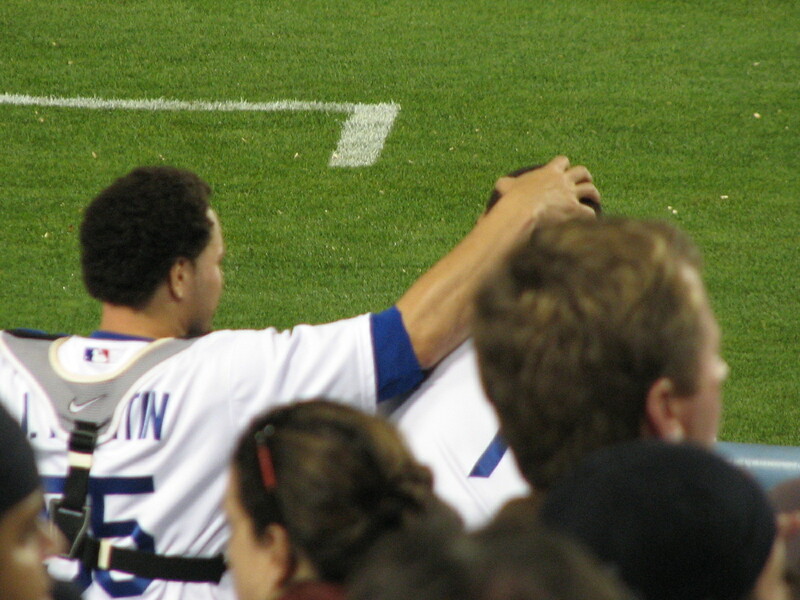 Bills and Martin walking to the dug out. Don’t they look chummy? Beltran to have a five-man infield. How often does that really work? ball to Reed, who you thought would get the for sure out at home. probably relieved that he didn’t need to be the hero of the night. bottom of the ninth that we were going to win off a walk-off walk. Well, a walk-off error is good enough for me.